Environment Minister Peter Kent has repeatedly said the government does not muzzle its scientists. But Kent's office stopped an Environment Canada researcher from talking to journalists about a report on last year's unprecedented Arctic ozone hole. It�s the latest case uncovered by Postmedia News where ministers� offices or the Privy Council Office have prevented federal scientists from talking to the media about their science. The documents also say Kent�s office and the Privy Council Office, which reports to the prime minister, decide when and if Environment Canada scientists are allowed to brief the media about anything from wildlife to water quality. Last fall, Kent was adamant in the House of Commons that �we are not muzzling scientists.� And the minister reported to a parliamentary committee in May that �circumstances simply did not work out� to allow Tarasick to give interviews when a study he co-authored on the Arctic ozone hole was published in Nature, a leading science journal. The documents show Tarasick was keen and available to discuss the remarkable changes seen in the Earth�s protective ozone layer, but Kent�s office would not permit him to speak to journalists when the study came out. �The department recommended to the Minister�s office that this interview take place,� the documents say, referring to a request from Postmedia News to speak with Tarasick about the study. �The interview was denied.� Requests from CBC, Radio Canada and CTV to interview Tarasick about the ozone hole were also denied. The reporters were told the interviews �cannot be granted.� Instead, they were emailed �approved� written comments about the ozone hole. Tarasick, a research scientist based at Environment Canada�s atmospheric research centre in Toronto, has spent his career tracking ozone, which helps shield the planet from harmful radiation. The documents show he was game to discuss the study of the giant hole in the ozone layer that formed over the Arctic in 2011. Tarasick suggested the reporter contact some of his coauthors on the study at academic and foreign institutions. �My apologies for the strange behavior of EC (Environment Canada),� Tarasick wrote. The media office told the reporters to �attribute� a written response to Tarasick, but the documents suggest officials in Ottawa were in charge of the statement released. The heavily redacted documents do not say why Kent�s office would not allow Tarasick to discuss the study that attracted international attention when it was published on Oct. 2, 2011. The documents show that two weeks after telling journalists Tarasick could not talk about the study, Environment Canada officials changed their minds and decided he could do interviews. By then, the reporters had already aired and published their stories on the ozone hole study � without interviewing Tarasick. 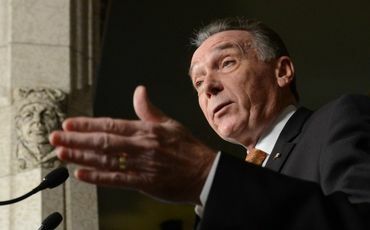 Kent�s office did not respond to requests for comment about the documents and Mark Johnson, in Environment Canada�s media office, would not say why Tarasick was prevented from giving interviews or how that fits with Kent�s statements that the government does not silence scientists. The silencing of Tarasick is not an isolated case. Federal geologist Scott Dallimore was not permitted to talk about a prehistoric flood that swept across northern Canada 13,000 years ago, while fisheries biologist Kristi Miller could not discuss a landmark study looking at premature death of salmon on the west coast. Canada�s federal scientists used to be encouraged to openly discuss their work with both the media and public. That changed under the Harper government, which the newly released documents show controls access to scientists and pre-approves their responses. The newly released documents suggest the only thing Environment Canada staff are free to discuss is the weather. The notes say the media relations office �will send the request to the Privy Council Office for approval� when it comes from a national or international media outlet, or relates to climate change, water quality, or protection of species such as polar bears or caribou. The documents show a team of media relation officers, �strategic communication advisors� and high-level officials are busy executing the department�s communication policy. Smol saw the system in action at an Arctic conference earlier this year when Environment Canada researchers were instructed to notify a �minder� from the department�s media office if they were approached by a reporter. Federal scientists were so frustrated they made public the instructions they had been sent by Environment Canada�s media office. �You can�t believe it is happening, but it is,� Smol said. The editors of the British journal Nature, one of the world�s top science journals, earlier this year called the government�s media policies a �Byzantine approach to the press, prioritizing message control and showing little understanding of the importance of the free flow of scientific knowledge. Strange. You have to wonder about the government's motive. Extrapolate to the nth. What's next? Shutting down the country's Internet to keep the truth from getting out? But the scientist should get some guts, and give the interviews anyways! What's Canada going to do? Send him to the Gulag? This comment is under review! Peter Kent is a liar. Back in the '90s he was a respected war reporter, but now... nobody capable of thinking for themselves believes him. it's been going on for some time. I doubt if this is unique to Canada. Stuff like this started manifesting and rearing its ugly head after the G20 and particularly after Carney had the Rothschild meeting just after New Years. Ignoring at least three environmental studies that contradicted the government sponsored one on the Tar Sands; trying to control the internet; attempted railroading of the CNOOC and Nexen deals; not to mentino APTA which benefits only the oldest partners and not Canada or America the Harper government is truly trying to please its masters. It's not pleasing us though and we will continue to fight this plutocratic government. I give Harper credit when it is due but I also believe government should be held accountable when it's wrong. Then there's the union busting; cutting social services etc.....Corporatism hard at work Friedmanizing North America. A problem in many countries that give priority to greed and commerce. This is outrageous and it's happening here as well. It's all about their "special interests"...MONEY.